Broadly speaking, kids have two kinds of play: structured and unstructured. Unstructured play is freeform make-believe. It’s what kids do when they build a house in the yard out of rocks and dead branches or play “yetis are from Pluto” on the way to school. This is the pure play that, really, only kids know how to enjoy. Soon enough, they grow a little older and turn to structured play, which is the kind that has rules. In this kind of play, you’re supposed to score points and count penalties, and if you’d rather just use your toys to make up your own stories, you’re playing like a baby. But when I watch my 7-year-old, I see a kind of play that sits between the two: semi-structured play. This is the halfway stage where kids become aware of rules, scores and goals, but they use them haphazardly and ignore them at will. When my kid and his friends play Mario or Zelda on the playground, I hear them talk about boss battles and cutscenes and the other mechanics that fill our games – but they’re woven in as just another part of the story. Instead of saying, “You’re almost dead,” they may say, “You’re down to one heart container.” They use numbers without counting them and rules without following them. A genre that can spawn months-long campaigns with marked-up character sheets and half a dozen sizes of dice is boiled down to something that you can finish in ten minutes with a second-grader. 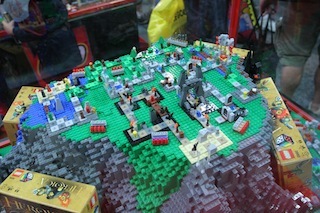 Last year, we picked up a board game called Heroica, by Lego. You probably knew that Lego has gotten its hooks into videogames, such as Lego Star Wars or Lego Batman. They also have a line of board games, which are much more creative. First you need to assemble the board and the pieces and then you play – and once you’ve played, you’re encouraged to change the game by rearranging the board, making up new rule and rebalancing the scoring. The manual even gives you practical tips: Take chances. Fail fast. Change one thing, test it out and see if it makes the game more fun. As a graduate of Marc LeBlanc’s two-day game design workshop, I admired how the team at Lego had pared down an entire practice into language that small kids could understand. 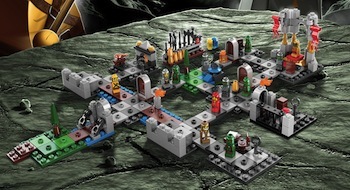 The Heroica games (so far there are five) are very, very simple tabletop dungeon crawls. A genre that can spawn months-long campaigns with marked-up character sheets and half a dozen sizes of dice is boiled down to something that you can finish in ten minutes with a second-grader. In the basic rules, your only job is to get from the start of the board to the end, working through obstacles like gates and rock slides that block your way, meanwhile snagging items (gold, potions) that will help you. You can battle monsters, but even if they kill you, you can just roll yourself back to life in two or three turns, and then you’re back in the game ­­– which means you’re now chasing your friends as they try to get to the goal. What you have, in other words, is Candyland with monsters. My kid and I grew bored with it, so we took the next step: we started changing the rules. First came the simple tweaks. We gave the boss more health, and we decided that killing a monster would earn you a piece of gold (that’s how basic this game is: it has no concept of “loot”). This gave us a risk-reward system, where taking a chance against the monsters gave you the opportunity to earn money toward a cool new weapon. Now the game was a little less primitive, but it didn’t make it more fun, so we turned it into a co-operative game, where we were both on the same team ­­­– defending each other, healing each other, and fighting together against the board. But the board didn’t fight back very hard. So we kept adding rules to spice it up. At this point, my design veered wildly away from my kid’s. I started introducing concepts like “permadeath,” and working out random monster movements, and juicing the loot, and rethinking the boss fights. I was making the game more and more complicated as I tried to find a way to make it satisfying. Meanwhile, he came up with a series of goofy and impractical ideas, and about one out of three was really good. For example, he suggested that instead of just fighting the monsters that roam the board, players might get attacked by the bushes and the trees. He also recruited his bonkers Ninjago ice dragon as a final boss, placing it at the end of the trail where it could loom over the rest of the set. Over time, as the sets get mixed in with the rest of his Legos, they’ve devolved from a game to a toy. The kid breaks up the paths and rearranges them for epic toy wars. The goblins pile onto a lunar rover. The heroes tell stories without any dice, but the remnants of the game – the idea of bosses and treasures and character progression, and loot – still hang around, and I overhear them as he plays out one scenario after another. I can’t expect him to stay in this middle ground between toys and games for long – where he’s happy to take or leave the rules so long as he gets to play. But there is one profession where that kind of thinking pays off – where changing, reinventing, and dropping the rules is an actual, pay-the-bills skill. That job, naturally, is game designer, and I’m really tempted to steer him into it. That way, he’ll never have to grow up. ———Chris Dahlen has lots of adventures with his kid on Twitter @savetherobot.